Archives of the Naval and Maritime Museum. 11 Dec.88, Signature of the delivery of the boats by the Israeli Navy, represented by Commodore HARAMATY, to Chile, represented by the head of Project “Tiburon” (Shark), Captain José FERNANDEZ. Also present the Chilean Naval Attaché Captain Rodrigo AGUAYO and the officers and ratings of the crews of LM COVANDONGA and LM IQUIQUE. 08 JAN.89, at 10.00 hrs. The Chilean flag is hoisted on both ships. The boats sailed to the Iskendurun naval base in Turkey where they were loaded on the German submersible transport “Submerger I” and taken to Valparaíso where they arrived on the 15FEB 89. They were assigned to the Command of the Fourth Naval Zone based at Iquique. 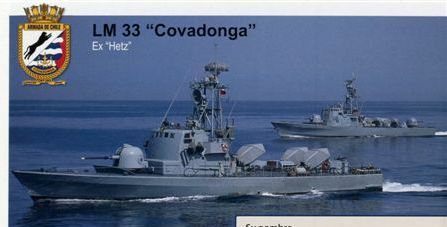 03.MAR.89 Missile boats are officially received by the Chilean Navy. Ceremony presided by Admiral José Toribio MERINO, Commander in Chief of the Navy. 18.MAR.89 War Ensign donated by Midshipmen class 1951. 13.MAR – 20.APR.89, Units carry out operational training. The units operating from Iquique were assigned to survey of the coast and anchorage, operation in northern seas, exercises with national and international forces. From April 1989 to January 1998 the units operated under the 4th Naval Zone based at Iquique and from then on up to their retirement they operated in the 3rd Naval Zone, stationed in Puerto Williams on the Beagle channel. Here they used their tactical capabilities operating in restricted waters. 1FEB.2000 is retired from service of the Chilean Navy. 10 JAN.2000 is retired from service of the Chilean Navy.